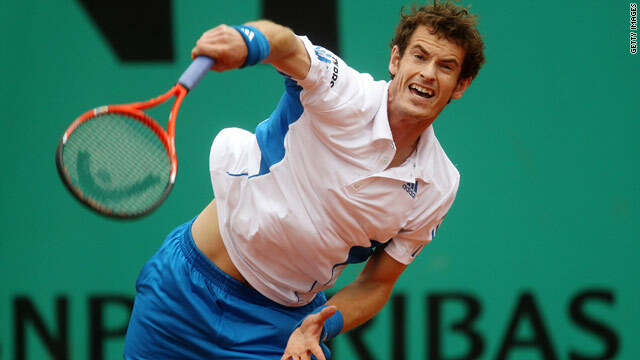 Andy Murray reached the quarterfinals at Roland Garros last year, his best performance at the French Open. (CNN) -- Fourth seed Andy Murray battled through frustrating rain delays to book his place in the third round of the French Open on Thursday night, while American star Andy Roddick also reached the last 32. Murray had to wait until early evening to resume his match against Juan Ignacio Chela, having led 6-2 3-3 when play was halted due to bad light on Wednesday night. Almost four hours later on a weather-affected fifth day of the clay-court Grand Slam tournament, the British player triumphed 6-2 6-7 (5-7) 6-3 6-2 on Court One for his sixth successive win against the Argentine. "It was a tough match. I've been pretty lucky in terms of rain breaks and not finishing matches in my career, so it was a good experience for me and one that I could perhaps have dealt with better," he told reporters. "I just felt a little bit tense at the start and actually felt fine as soon as I went behind. I felt much better. It was a bit strange, but that's how it was. I played better as the match went on." The 23-year-old Scot will next play Marcos Baghdatis, who went through exactly the same rigmarole before defeating unseeded Spaniard Marcel Granollers 4-6 6-1 7-5 6-2 on Court Three. The Cypriot was ranked as high as eighth in 2006 after reaching the Australian Open final and the semis at Wimbledon, but is now down at 28th. He has a 2-0 career record over Murray, but they last met in 2007. Sixth seed Roddick moved past the second round for just the third time in nine appearances at Roland Garros as he defeated Slovenian qualifier Blaz Kavcic 6-3 5-7 6-4 6-2 in a match lasting just under three hours. Roddick next faces another unheralded opponent in world No. 114 Teimuraz Gabashvili of Russia, who moved into the last 32 in Paris for the first time as he cruised past Slovenia's Grega Zemlja 6-3 6-1 6-1. Roddick's compatriot John Isner also went through, with the big-serving 17th seed defeating Switzerland's Marco Chiudinelli 6-7 (3-7) 7-6 (7-3) 7-6 (9-7) 6-4. Isner fired 38 aces and 83 winners in a match lasting more than three hours as he set up a clash with Czech 15th seed Tomas Berdych. French 13th seed Gael Monfils fell by the wayside with a 2-6 4-6 7-5 6-4 9-7 defeat by world No. 92 Fabio Fognini. The Italian sealed victory after they resumed at 5-5 in the deciding set to earn a clash with Swiss 20th seed Stanislas Wawrinka. Croatian 14th seed Ivan Ljubicic was tied at one set apiece with American Mardy Fish when bad light ended play for the day, winning the first set 6-2 but losing the second 10-8 in a tie-break. Brazilian 24th seed Thomaz Bellucci was also level against Spain's Pablo Andujar, who won the first set 6-1 before losing the second 6-3. They will resume play on Friday along with four-time champion and world No. 2 Rafael Nadal, who has yet to start his second-round clash with Argentina's Horacio Zeballos.